To further my goal of going organic in my food choices, I decided I needed another way to make good quality compost to increase the fertility of my raised beds. Better soil, better vegetables. 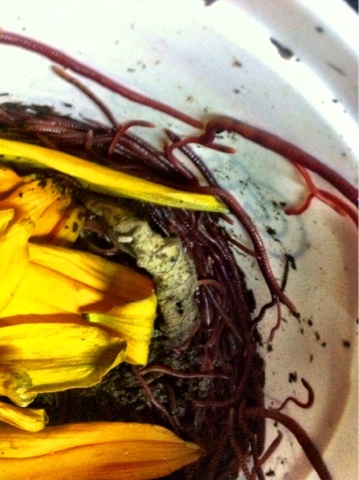 My sister, Amanda, mentioned worm composting and I took the idea and ran with it. 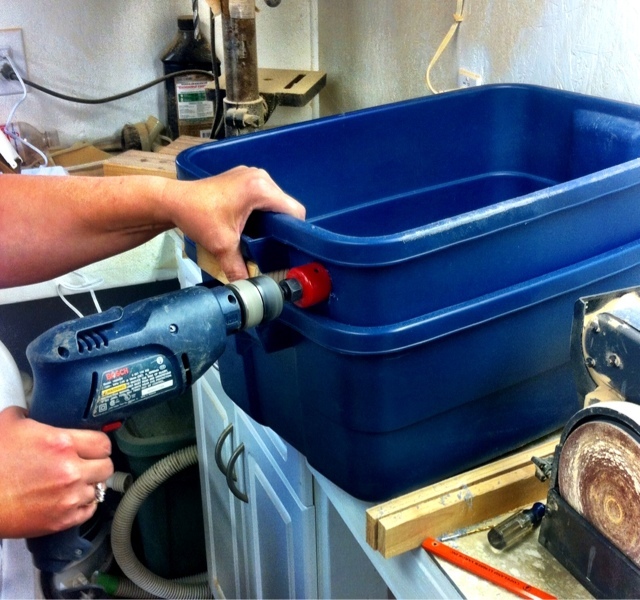 I shopped the Internet for vermicomposting products and watched a couple of YouTube videos on how to build your own. Such a decision, spend roughly $100 for a Worm Factory that is uniform, tidy, & streamline or spend less than $20 for homemade and risk something Clampet-like. 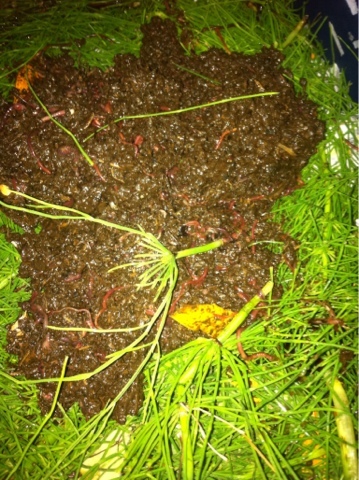 I found a website www.findworms.com and used it to find a local worm farmer. I contacted her this past Wednesday and found out she was going to be at the Bow Little Market (www.bowlittlemarket.wordpress.com) the very next afternoon. Visiting with her on the phone convinced me that I could easily make a good home for my worms without a large cash outlay. $80 savings for building instead of buying will free up just that much more of the budget for organic, non-GMO foods! I bought a one pound tub of Red Wiggler worms that was estimated to be 4,000 worms. They cost $25.00. Here you can see the aging flower petals and the squash blossom of off a small zucchini. I have read that squash and melons are a favorite dinner for the worms. 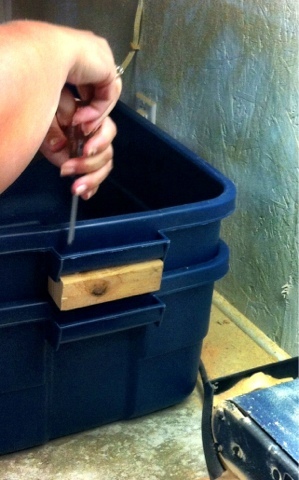 This is how I built my vermicomposting bin after watching several You Tube videos. It seemed good advice to use a sturdy container over a cheap one. 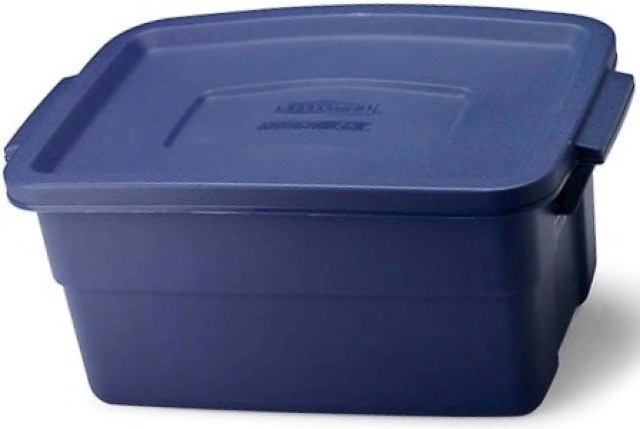 So I decided on two Rubbermaid Toughneck 10 gallon tubs with lids. They were $5.97 each. I also purchased a half yard of fine black tulle. Add to the tally $.67. 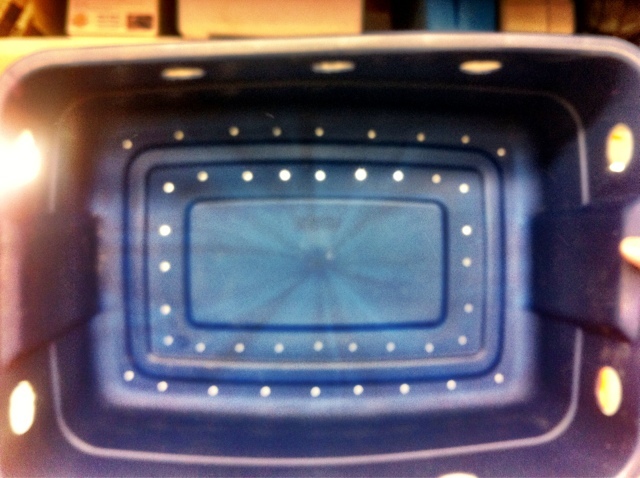 The tubs will be stacked inside each other. The outer one left intact to catch the worm tea. The inner one will be altered to have 1/8" holes in the bottom to allow the worm tea to drain off, and 1-1/4" holes to provide air circulation to ensure aerobic conditions for the health of the worms and to prevent smelly anaerobic composting. The fine tulle is used to cover the vent holes, to prevent the worms from exiting and fruit flies from entering. I decided I wanted a deeper worm tea catchment area, so i added wood blocks inside the handle to adjust the depth that the top bin would stack into the bottom bin. Fortunately there were two holes in the bottom of each handle, all I had to do to attach the wood blocks was to add a couple of screws. 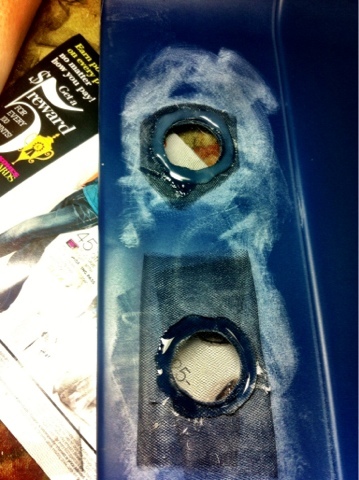 Then I used an 1-1/4 hole saw to make the vent holes. A 1-1/4 spade bit could have also worked. Then the drain holes. I used a 1/8" bit and drilled several holes in the lowest portion of the bottom. Here you can see the holes as the container is held up to the light. The holes look a lot bigger in the picture than they really are. To cover the vents, I used a triple layer of the black tulle and a hot glue gun. I found it worked best to lay down a ring of hot glue around the holes, imbed the tulle layers into the glue, then top with another ring to ensure a tight seal. I did this on the inside if the container to keep the exterior tidy looking. Before laying down the hot glue, I used the hand sander to rough up the area around the holes to help the glue get a good hold on the smooth plastic. I trimmed the excess tulle as close to the glue ring as I could. 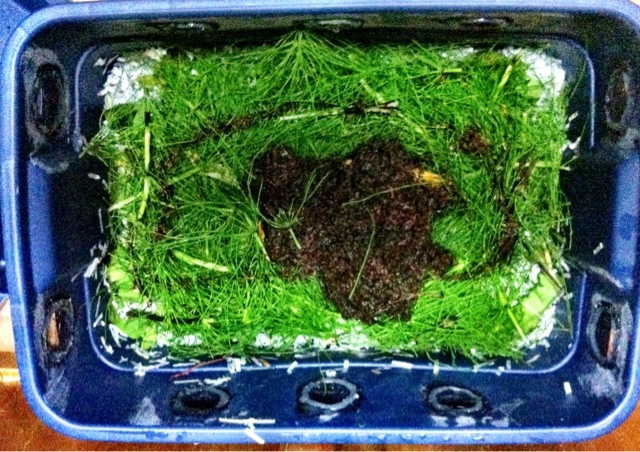 I figured it would keep compost from getting caught in them when I empty the bin. Now to feed the worms. I added shredded paper. 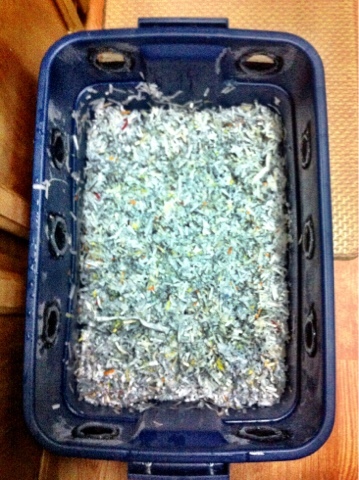 I was going to shred newspapers but I discovered my shred bin was already full of paper shreds, so I just used that. I wetted down the paper by sprinkling handles of water then stirring with my hands till they were uniformly wet, but not drippy. 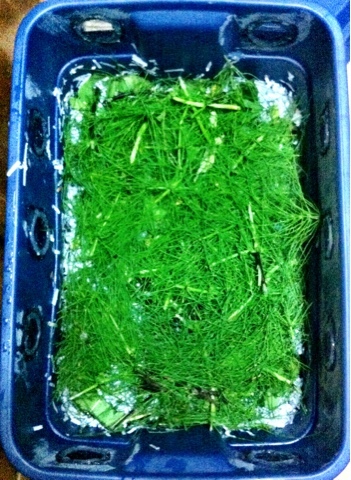 Then I layers in the greens. I had very little veggies trimmings as I haven't cooked dinner in a few days, but I did find some cherries that were getting moldy in the fruit drawer. I added some cut up flowers from an old cut arrangement and bulked up the fresh greens with handfuls of torn up horsetails from my yard. Last of all, I added the worms. So, here is the finished product. I placed it in a spot on the back deck that is always shaded and will be sheltered from the rain. So, how much did this cost? $37.61. And it was completed in just an evening! I've read that a pound of worms will eat a half pound of produce scraps a day! So I will be adding new veggie matter everyday, as well as a handful of my garden soil to introduce the soil bacteria and provide grit for the worms' gizzards. I've also been saving my eggshells and I will be grinding mine up in a blender and giving it to the worms for added grit and to boost the calcium content of my soil after the finished compost is used to amend the soil in my raised bed gardens. 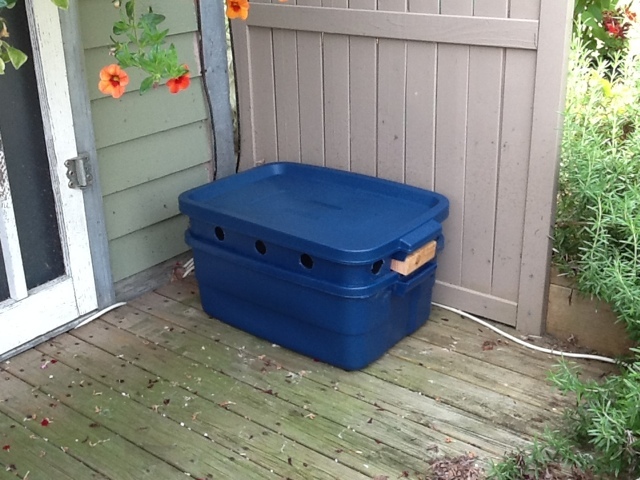 I will need to protect the worms from freezing so I intend on bringing my worm farm into the garage this winter. If done properly, balancing carbon and nitrogen, brown and green, it is supposedly odor-free.